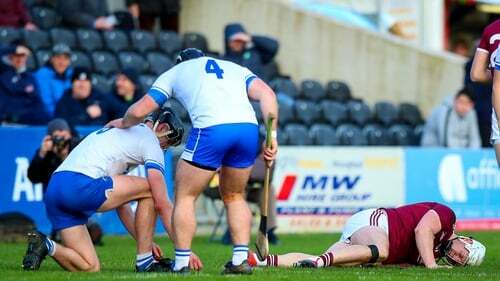 Galway are sweating on the fitness of Joe Canning after their star forward was stretchered off during the Allianz Hurling League semi-final defeat to Waterford. The 2017 Hurler of the Year was in the wars at Nowlan Park, appearing to have injured his knee during the first half before playing on, until he was forced from the field late on following a crunching - but perfectly legal - shoulder from Kevin Moran. Speaking after the game, Tribes manager Micheál Donoghue said it was too early to tell how long Canning would be out for but that it was in fact a groin injury rather than knee or shoulder. "It's unfortunate that he picked up one," the manager told RTÉ Sport after the game. "He's still being assessed so we'll just have to wait and see the severity of it. "I think it was his groin. He took a few heavy hits on it and I'd be intrigued to watch it back and see the hits he got going into it, just before it (the shoulder)." It is just under seven weeks until Galway begin their Leinster SHC title defence at home to Carlow. Donoghue was left to rue seven second-half wides yesterday as Waterford overturned a two-point half-time deficit to win on a 1-18 to 0-19 scoreline. "I thought we started well," he said. "We showed great work and attitude but 1-1 before half-time closed the gap for them. "In the second half we missed a lot of chances and when the opportunity presented itself for them their decision-making was probably just a bit better than ours." Despite their league exit, Donoghue is happy with the foundations laid for the summer ahead. "It was a massive game in terms of getting experience for our younger fellas and hopefully it's something we can build on for the Championship. "In terms of the league, we've used in excess of 30 players. Our agenda at the start was to try and get as much game time into as many of them as possible and we succeeded with that. "A few young fellas have put their hands up for Championship and we have a lot of experience to come back into the squad."